This is the seed head of the plant, after the flower has gone. The flower is here. 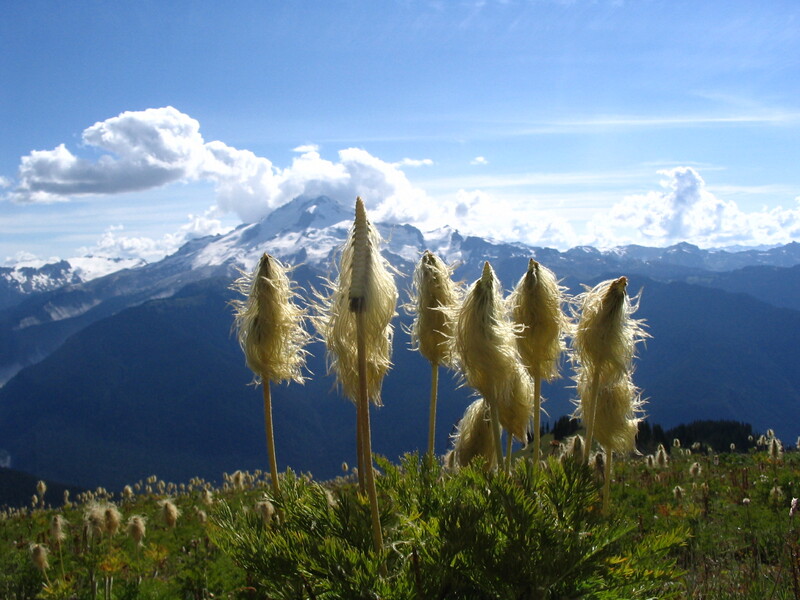 The plant has many nicknames, including Chalice Flower and Western Pasqueflower, and the unusual looking seed head has given it several more, including Old Man of the Mountain and Tow-headed Baby, and we’ve even heard it called “Mouse-on-a-stick.” The ones in this picture are certainly mouse-like. Washington’s Glacier Peak is in the background. This entry was posted on March 30, 2011 by nwwildflowers. It was filed under alpine/subalpine meadow, August, buttercup, Cascades, Mid Elevation, Washington, white and was tagged with Chalice Flower, flower, Glacier Peak, Old Man of the Mountain, Tow-headed Baby, Western Pasqueflower, Wildflowers.